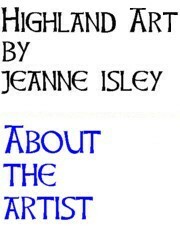 The rugged landscape and wild beauty of the Scottish Highlands form the backbone of the work of artist Jeanne Isley. Isley, a Canadian artist, has been captivated by that land of lochs, glens and bens since her first trip to Scotland over 20 years ago. Having been an artist most of her life, and long before she began painting Scottish landscapes, she had explored numerous diverse styles of artistic expression; but it was an initial journey through the imposing Highlands of Glencoe that was to become a pivotal episode in her artistic career. That trip marked the launch of an artistic period of expression characterized by painting and hiking throughout the Western Highlands and Islands that continues to this day. Isley confides, "It is a land which allows me 'breathing space,' a place of emotional and spiritual quiet." Since 2005 Isley has maintained a studio in the small Highland village of Kinlochleven near Glencoe which she visits frequently from Canada. For further information, please contact Jeanne by e-mail at jeanneisley5@gmail.com.